Stainless steel 19mm round bar furniture on concealed fixing backplate, with a range of cover plates to suit both traditional key and profile cylinders, as well as English and DIN lock cases. A modular system which offers a complimentary uniform style throughout your building no mater what locks/lock cases are used. 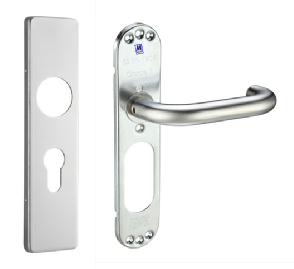 19mm Round bar, concealed fixing, lever furniture on backplate with euro cover plate. Finish: Stainless Steel. Centres: 92mm. Supplied with both wood screws and bolt through’s. Bit key, Euro Profile & GB Oval.